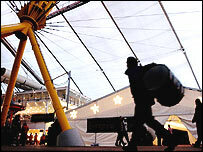 Scene of pomp, ceremony and great controversy in 2000, Greenwich's Millennium Dome is back in use - as Crisis' main Christmas shelter for the homeless. "I name this the Dome Hotel," says John Cohen, 72, as he makes his way through the vast Dome. "It beats the Ritz, Claridges or the Dorchester. It's absolutely marvellous." This is John's 20th year at the homeless charity's London Christmas project. He no longer sleeps rough, having found a flat 10 years ago, but still comes along "to show my respect for those who looked after me". "And," he says, "because otherwise I'd be sat at home looking at four walls. I love to come here because of the wonderful warm welcome." 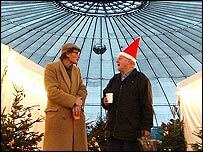 Of six homeless shelters open across London from 23-30 December, the Dome is the main one. Under greying roof fabric the charity has set up a place to sleep for about 1,200 people. And along one side of the huge structure, volunteers staff a comprehensive health centre - with dentists, opticians, podiatrists and dependency counsellors. There are also housing advisers, TV rooms, a hairdresser and a clothing pick-up stall. The Samaritans are on hand, waiting by a fence separating off the empty expanse that is the rest of the Dome's floor space. Art workshops, musicians playing, drama, yoga and circus-skill teachers have all set up shop. Everywhere there are volunteers, as Crisis' guests arrive. Crisis found out the Dome was available to use less than a month ago and the set up took just five days. It replaces a more-compact warehouse used in previous years. The charity's boss, Shaks Ghosh, breaks off from pointing one homeless lady in the direction of where she can get shoes, and says the place looks "stunning". "I hope for a lot of people it will be that moment when they think 'I am on my upward spiral'," she says. "If you take people to a grungy warehouse, it doesn't give them the confidence or enthusiasm to start the rest of their life. Up in the medical centre, Dr Justin Varney is keeping a watch on infection control - after, he says, some diarrhoea and vomiting last year. A team of 30 doctors and 40 nurses will be checking patients, and encouraging them to keep any follow-up appointments. 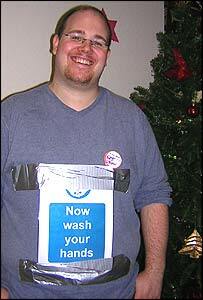 The doctors' receptionists, he stresses, are friendly and welcoming. "If you think what it's like when you go along - and the receptionist says 'no'. You have enough power to fight your own corner. "But a homeless person might not have that - they might walk in and the reception they get makes them feel they should leave." 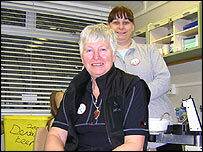 It is the 'bread and butter" basic dentistry that will keep Angela Honey, dentist, and Liz Deuchars, hygienist, occupied in their vans. With two surgeries, they saw 200 people last year, and hope for more with three this time. They say routine repairs help give patients back some confidence after missing hard-to-get-to check-ups. Shuttle bus services from central London, and public transport to Greenwich, are getting people to what some feel is an out-of-the-way location for a shelter. They can drop in to use the services for the day, eat at the Dome's cafe or stay at night in the sleeping area. One 41-year-old rough sleeper, who did not wish to be named has just picked up a change of clothing from the "excellent" clothes stall. But he is angry at not being let into the Dome until the afternoon and fed-up after a stint queuing outside in the cold. Homeless people need more permanent night shelters, he says, year round. "This seems to be a bit out of the way - it wasn't what I thought it would be." And he is dismissive of the medical services - "When can you go back and see the doctor?" he shrugs. They are questions he heads off into the Dome to answer - before he decides whether to stay on or return to his pitch under Blackfriars Bridge in central London.